This week I welcome Todd Defren, principal at SHIFT Communications, prolific blogger at PR Squared and tweeter on Twitter to a special Halloween episode of The Rundown. Mwa ha ha ha ha! Dress in your favorite costume and join us for this live internet broadcast. As always, The Rundown is my weekly LIVE podcast featuring an analysis or summary of something by a knowledgeable person – and me. As principal, Defren leads client services and business development efforts for SHIFT. More importantly he and his team have been instrumental in bringing the Social Media Release to life. I have some questions of my own about that, about what prompted him to get involved in the whole movement and what it means to public relations and journalism. I also plan on asking him what it’s like to bop from Boston to San Fransisco like a tennis ball. Don’t miss this exciting Halloween edition. 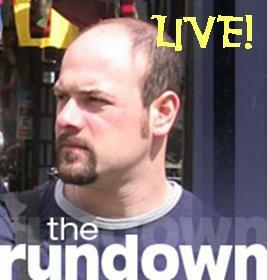 The Rundown airs on Tuesdays at 1:30pm Eastern. Because it’s live, your calls are welcome. Whenever I have I guest you’d like to talk to, question or heckle, just call in at (646) 716-8329. You can also email your text or audio comments to me before the show and I’ll fit them in. The archives will be available at my BlogTalkRadio host page or by subscribing to the show’s RSS feed. You can also subscribe to the show on iTunes.